The revelations that US ally Abdelhakim Belhadj is now leading ISIS in Libya should come as no surprise to those who have followed US policy in that country, and throughout the region. It illustrates for the umpteenth time that Washington has provided aid and comfort to precisely those forces it claims to be fighting around the world. According to recent reports, Abdelhakim Belhadj has now firmly ensconced himself as the organizational commander of the ISIS presence inside Libya. 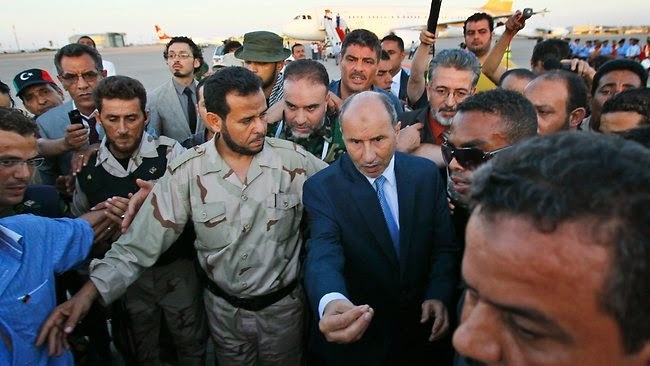 The information comes from an unnamed US intelligence official who has confirmed that Belhadj is supporting and coordinating the efforts of the ISIS training centers in eastern Libya around the city of Derna, an area long known as a hotbed of jihadi militancy. While it may not seem to be a major story – Al Qaeda terrorist turns ISIS commander – the reality is that since 2011 the US and its NATO allies have held up Belhadj as a “freedom fighter.” They portrayed him as a man who courageously led his fellow freedom-lovers against the “tyrannical despot” Gaddafi whose security forces at one time captured and imprisoned many members of the Libyan Islamic Fighting Group (LIFG), including Belhadj. 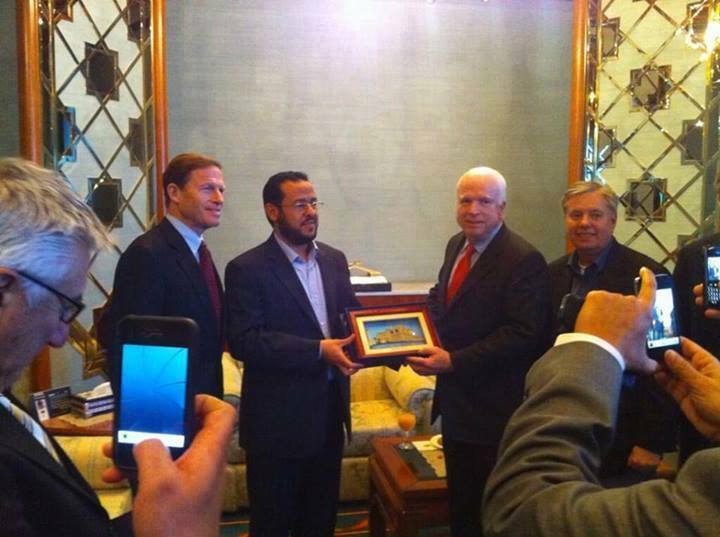 Belhadj served the US cause in Libya so well that he can be seen receiving accolades from Sen. John McCain who referred to Belhadj and his followers as heroes. He was initially rewarded after the fall of Gaddafi with the post of military commander of Tripoli, though he was forced to give way to a more politically palatable “transitional government” which has since evaporated in that chaotic, war-ravaged country. Belhadj’s history of terrorist activity includes such “achievements” as collaboration with Al Qaeda in Afghanistan and Iraq, and of course his convenient servitude to the US-NATO sponsored rampage across Libya that, among other things, caused mass killings of black Libyans and anyone suspected of being part of the Green Resistance (those loyal to the Libyan Arab Jamahiriya led by Gaddafi). Although the corporate media tried to make a martyr of Belhadj for his alleged torture via the CIA rendition program, the inescapable fact is that wherever he goes he leaves a violent and bloody wake. While much of this information is known, what is of paramount importance is placing this news in a proper political context, one that illustrates clearly the fact that the US has been, and continues to be, the major patron of extremist militants from Libya to Syria and beyond, and that all talk of “moderate rebels” is merely rhetoric designed to fool an unthinking public. There is ample documented evidence of Belhadj’s association with Al Qaeda and his terrorist exploits the world over. Variousreports have highlighted his experiences fighting in Afghanistan and elsewhere, and he himself has boasted of killing US troops in Iraq. However, it was in Libya in 2011 where Belhadj became the face of the “rebels” seeking to topple Gaddafi and the legal government of Libya. The Libyan Islamic Fighting Group was formed in 1995 with the goal of ousting Colonel Qaddafi. Driven into the mountains or exile by Libyan security forces, the group’s members were among the first to join the fight against Qaddafi security forces… Officially the fighting group does not exist any longer, but the former members are fighting largely under the leadership of Abu Abdullah Sadik [aka Abdelhakim Belhadj]. So, not only was Belhadj a participant in the US-NATO war on Libya, he was one of its most powerful leaders, heading a battle-hardened jihadist faction that constituted the leading edge of the war against Gaddafi. Nowhere was this more clearly demonstrated than when the Libyan Islamic Fighting Group (LIFG) took the lead in the attack on Gaddafi’s compound at Bab al-Aziziya. In this regard, LIFG was provided intelligence, and likely also tactical support, from US intelligence and the US military. This new information about Belhadj’s association with the suddenly globally relevant ISIS certainly bolsters the argument that this writer, among many others, has made since 2011 – that the US-NATO war on Libya was waged by terrorist groups overtly and tacitly supported by US intelligence and the US military. Moreover, it dovetails with other information that has surfaced in recent years, information that shines a light on how the US exploited for its own geopolitical purposes one of the most active terrorist hotbeds anywhere in the world. According to the recent reports, Belhadj is directly involved with supporting the ISIS training centers in Derna. Of course Derna should be well known to anyone who has followed Libya since 2011, because that city, along with Tobruk and Benghazi, were the centers of anti-Gaddafi terrorist recruitment in the early days of the “uprising” all through the fateful year of 2011. But Derna was known long before that as a locus of militant extremism. Almost 19 percent of the fighters in the Sinjar Records came from Libya alone. Furthermore, Libya contributed far more fighters per capita than any other nationality in the Sinjar Records, including Saudi Arabia… The apparent surge in Libyan recruits traveling to Iraq may be linked the Libyan Islamic Fighting Group’s (LIFG) increasingly cooperative relationship with al-Qa’ida which culminated in the LIFG officially joining al-Qa’ida on November 3, 2007…The most common cities that the fighters called home were Darnah [Derna], Libya and Riyadh, Saudi Arabia, with 52 and 51 fighters respectively. Darnah [Derna] with a population just over 80,000 compared to Riyadh’s 4.3 million, has far and away the largest per capita number of fighters in the Sinjar records. And so, the US military and intelligence community has known for nearly a decade (perhaps longer) that Derna has long been directly or indirectly controlled by jihadis of the LIFG variety, and that that city had acted as a primary recruiting ground for terrorism throughout the region. Naturally, such information is vital if we are to understand the geopolitical and strategic significance of the notion of ISIS training camps associated with the infamous Belhadj on the ground in Derna. This leads us to three interrelated, and equally important, conclusions. First, Derna is once again going to provide foot soldiers for a terror war to be waged both in Libya, and in the region more broadly, with the obvious target being Syria. Second is the fact that the training sites at Derna will be supported and coordinated by a known US asset. And third, that the US policy of supporting “moderate rebels” is merely a public relations campaign designed to convince average Americans (and those in the West generally) that it is not supporting terrorism, despite all the evidence to the contrary. The news about Belhadj and ISIS must not be seen in a vacuum. Rather, it should be still further proof that the notion of “moderates” being supported by the US is an insult to the intelligence of political observers and the public at large. For more than three years now, Washington has trumpeted its stated policy of support to so-called moderate rebels in Syria – a policy which has at various times folded such diverse terror groups as the Al Farooq Brigades (of cannibalism fame) and Hazm (“Determination”) into one large “moderate” tent. Unfortunately for US propagandists and assorted warmongers however, these groups along with many others have since voluntarily or forcibly been incorporated into Jabhat al-Nusra and ISIS/ISIL. Recently, there have been many reports of mass defections of formerly Free Syrian Army factions to ISIS, bringing along with them their advanced US-supplied weaponry. Couple that with the “poster boys” for Washington policy, the aforementioned Hazm group, now having become part of Jabhat al Nusra, the Al Qaeda linked group in Syria. Of course these are only a few of the many examples of groups that have become affiliated with either the ISIS or Al Qaeda brand in Syria, including Liwaa Al-Farouq, Liwaa Al-Qusayr, and Liwaa Al-Turkomen to name just a few. What has become clear is that the US and its allies, in their unending quest for regime change in Syria, have been overtly supporting extremist elements that have now coalesced to form a global terror threat in ISIS, Nusra, and Al Qaeda. But of course, this is nothing new, as the Belhadj episode in Libya demonstrates unequivocally. The man who was once Al Qaeda, then became a “moderate” and “our man in Tripoli,” has now become the leader of the ISIS threat in Libya. So too have “our friends” become our enemies in Syria. None of this should surprise anyone. 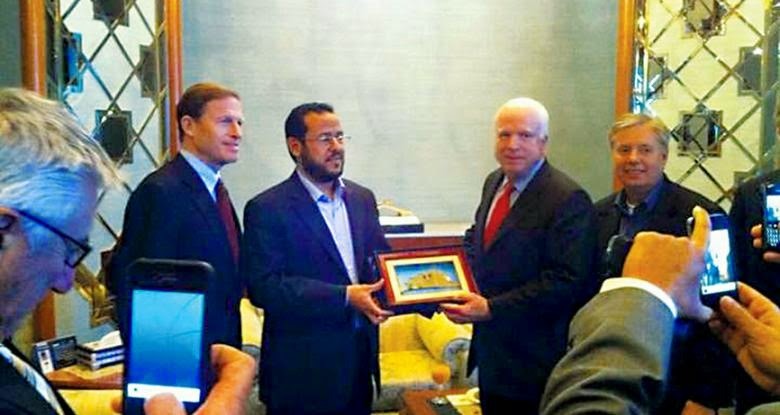 But perhaps John McCain would like to answer some questions about his long-standing connections with Belhadj and the “moderates” in Syria. Would Obama like to explain why his “humanitarian intervention” in Libya has become a humanitarian nightmare for that country, and indeed the whole region? Would the CIA, which has been extensively involved in all of these operations, like to come clean about just who they’ve been supporting and what role they’ve played in fomenting this chaos? I doubt any such questions will ever be asked by anyone in the corporate media. Just as I doubt any answers will ever be furnished by those in Washington whose decisions have created this catastrophe. So, it is for us outside the corporate propaganda matrix to demand answers, and to never let the establishment suppress our voices…or the truth.